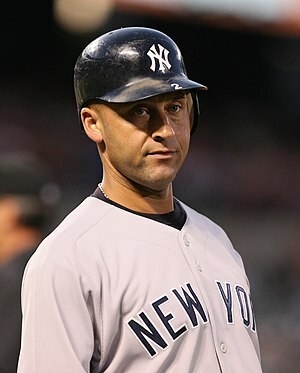 Inasmuch as Derek Jeter got his 3,000th career hit earlier today, I thought it appropriate to feature him and his signing habits in today’s blog. Living in Los Angeles is a real luxury for me. I am able to go after Hollywood autographs, the NBA and Major League Baseball as well. Over the years, I have encounter Mr. Jeter many times in Anaheim at the stadium, after games and at the team hotel. This poor man is virtually assaulted by fans every where he goes. He rarely gets a moment of privacy. In spite of all of this, I have found him to be a very willing signer. I have obtained his signature over a dozen times in all. In my encounters with Derek Jeter, I have found him to be pleasant, considerate and thoughtful. You can tell he always has his guard up (I guess he has to as he is always in the spotlight). In many ways he reminds me of the late, great Yankee legend, Joe Dimaggio with the way he carries himself. The bottom line: If you can catch him at a time when he isn’t mobbed by other fans, Derek Jeter will probably sign an autograph for you. This entry was posted in Uncategorized and tagged 3 000 hit club, Derek Jeter, Hollywood, Joe Dimaggio, Los Angeles, Major League Baseball, MLB autographs, New York Yankee, Yankee, Yankees. Bookmark the permalink.